After the untimely death of their old college pal, five friends (and one new girlfriend) descend upon the Wisconsin summer home they frequented in their 20s. The creep factor at the cabin is high, with a thumping in the crawl space, blood spurting from the pipes, and a cockroach infestation in the guest bedroom. When a storm moves in, trapping them in the woods, they find themselves faced with the ultimate human dilemma, to kill or be killed, in order to make it to morning. 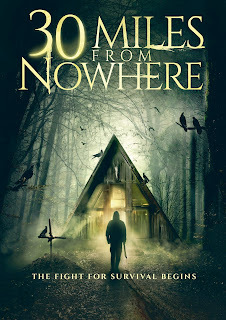 30 MILES FROM NOWHERE is a thriller about what fear does to the human brain, and how an ordinary citizen becomes an unwitting soldier.After the untimely death of their old college pal, five friends (and one new girlfriend) descend upon the Wisconsin summer home they frequented in their 20s. The creep factor at the cabin is high, with a thumping in the crawl space, blood spurting from the pipes, and a cockroach infestation in the guest bedroom. When a storm moves in, trapping them in the woods, they find themselves faced with the ultimate human dilemma, to kill or be killed, in order to make it to morning. 30 MILES FROM NOWHERE is a thriller about what fear does to the human brain, and how an ordinary citizen becomes an unwitting soldier.